Cost to install recessed lighting varies greatly by region (and even by zip code). Get free estimates from electricians in your city. Cost to install recessed lighting varies greatly by region (and even by zip code). The cost of installing recessed lighting is $130​ per light. How much does it cost to install recessed lighting 1? Recessed lighting 1 is a type of ambient, or full, lighting frequently installed in kitchens, living rooms, and family rooms. The lights are installed in cans, which are set into, or recessed into, the ceiling. The lights are all linked together on the same circuit, so turning one switch will light the whole room. Many homes use recessed lighting 1 because it’s easy, practical, and fairly inexpensive. Recessed lights 1 work with different interior design styles and evenly light the room more efficiently than a single light fixture. Most people install four to six recessed lights 1 at a time to adequately fill a space. The lights typically cost around $130 on average to install per light, so a total of six lights will cost you about $780. While recessed lights 1 aren’t overly difficult to install, they should always be put in by a professional electrician. Working with electricity should only be done by a professional. In addition, there are several factors that go into the installation of recessed lights 1, such as spacing, layout, and cutting the correct sizing for the cans, which can complicate the job for even a skilled DIY homeowner. Before you purchase any recessed light 1 fixtures to install in your home, you will need to keep several things in mind. The type of ceiling you have, whether or not there is insulation present, the slope of the ceiling, and its depth will all impact what type of can you have. Likewise, how easy the area is to access. Attics are typically the easiest places to install recessed lights 1, as they can be accessed from above and below. Installing lights between floors may be more complicated, particularly if the space between the floors is shallow. In every case, you should always have your ceiling inspected by a licensed electrician before purchasing lights. Your electrician can measure the space available, and decide whether how to tackle the project. In an attic or new construction installation, he will likely work from above. Between floors, he will likely work from below, cutting into the ceiling and running wires below the floor so as not to disturb the area above. He will also let you know what type of lights are needed to complete the job, so you can purchase accordingly. Even the brightest recessed lights 1 won’t illuminate your room if they aren’t spaced out properly. The standard rule for where you place the lights is dictated by the size of the lights you purchase. Recessed lights 1 come in two basic sizes: 4 and 6-inch. 4-inch lights are installed a minimum of 4-feet apart from one another across the ceiling, while 6-inch lights are installed a minimum of 6-feet apart from one another. These should all be placed about 12 to 18-inches in from the walls and spread evenly across the ceiling to achieve the best illumination. Not all recessed lights 1 are the same, and the ones that you have installed in your home will likely be dictated by the architecture of your ceiling, what’s above it, and whether this is new construction or a remodel. The housing or the can that the recessed light 1 sits inside will differ based on these characteristics. The trim is the portion of the light that you can see. This is a rim that extends outward from the edge of the light onto the ceiling. It helps seal in the light and covers up the edge of the hole in the ceiling. Trim can come in different finishes to match your decor, although the most common is a white finish that blends with most ceilings. You can also find trim with different shapes or textures to give your lights a distinctive look. Many recessed lights 1 can accommodate a wide range of bulbs. Others are designed to accept only a single type of bulb such as fluorescent or LED. Each has its attributes that may influence your final decision. LED and CFL bulbs are the most commonly used today, lasting the longest and providing the most options. For many years, most people were accustomed to the warm color of incandescent lights. Today, however, most lights are available in a range of different colors and tones, ranging from the warm yellow to bright white, usually with no cost difference between them. Because recessed lights 1 provide ambient light, or general light, in the room, the color of your bulbs will dictate the overall tone of the colors in the room. Lights with a "Warm" label will give your home a slightly golden glow or tone. To find lights with this color, look for a Kelvin number between 2000 and 3000. Lights with a "White" label will show the true colors as if they were viewed outdoors. To find lights with this color, look for a Kelvin number between 3500 and 4100. Lights with a "Blue-White" label provide good reading light. Look for a Kelvin number between 5000 and 6500. Regardless of what type of lighting you can purchase, you will find that they are rated either IC or Non-IC. Any light rated IC can be installed in an area where insulation will be directly touching the can, so attic spaces or ceilings that have insulation between floors can use an IC can. Non-IC rated cans, however, must be installed at least 3-inches from any insulation. If you are unsure, ask your electrician to check, or opt for IC lights, which can be installed anywhere. Most houses are wired with either aluminum or copper wire. Aluminum is less expensive than copper, so many newer homes may have this type of wiring, but in general age and the electrician’s preferences factor in which one your home may have. When planning on a recessed light 1 addition, you need to ensure that the lights and wires you are using are compatible with what’s already in the home. For this reason, you will need to match both the type of wire and the gauge. If your wire is old or fabric insulated, your electrician may need to replace some of the wiring before installing your new lights. The cost of rewiring a home is around $10,400. Every home has a total amount of amps or electrical power that it can supply. Your appliances, lights, and accessories all use a degree of that power. Before you begin adding recessed lights 1 to a room, you need to determine how many amps are on the line you are using, and how many amps each one of the recessed lights 1 will use. The general rule of thumb is that you need to keep below 80% of the amps on the line. So if you have 100 amps on the line you are using, then the total amount your recessed lights 1 can use is 80. Have your electrician determine how many amps you have available, then check for the wattage on each one of the cans you are considering to determine how many you can have installed. The labor and installation of your recessed lights 1 may change slightly depending on the depth of your ceiling, and what’s located above it. Installing recessed lights 1 in new construction and below an attic may be slightly less expensive, around $100 a light, rather than $130 for installing lights between floors or on sloped ceilings. Before installing your lights, your electrician will generally inspect the ceiling and wiring, and make any recommendations about the type of cans needed. He’ll also likely to draw up a template to show the position of the new lights in the room and locate the necessary switches. From here, the holes are cut into the ceiling to accommodate the lights. The wires are run from the circuit box to the ceiling where the lights will be placed. The lights are all hooked together, so the wires will run from one source directly to the next across the room. The cans are then either dropped in from above, or pushed in from below and expanded on the back to hold them in the floor above. The collar or trim is added on the exterior, and the electrician will connect the wires. Most electricians charge around $65-$85 an hour. It takes roughly ½ to 1 hour per can, depending on how difficult the location is to reach. So the total project will take between 3 and 6 hours, for a total of $780 for 6 lights. Recessed lights 1 require some type of ceiling in order to function, so they aren’t very common out of doors. 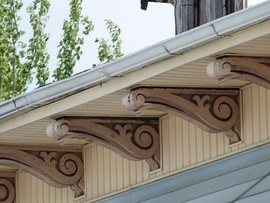 However, they can be installed in a porch ceiling or beneath an overhang on the front steps in place of sconces. Installation is similar, although the project typically involves fewer lights, with two to four being the most common. Because recessed lights 1 are ambient, you may wish to have a dimmer switch installed at the same time. Most recessed lights 1 are dimmer compatible; the switch itself costs around $50 for a 3-way light. It is not recommended tackling this project as a DIY project, except by those homeowners who have extensive electrical experience. In most areas, permits are required before the installation of recessed lights 1 or any other major electrical changes. Check with your town or city hall before starting for more information. It may be less expensive to install recessed lights 1 in new construction or in rooms being fully renovated, as the ceiling is easier to access. Costs may be around $100 a can, rather than $130 and up. To use dimmer switches, you must also invest in dimmer bulbs. Most recessed bulbs can be used on a dimmer for no additional cost; check the box label before purchasing to be sure. How do you install recessed lighting 1 in a ceiling? Recessed lights 1 are cans that are held in place above the ceiling by brackets 2. They are installed through a hole in the ceiling and connected to one another and the electrical circuit that powers them. How much does it cost to put in down lights? Down light is a recessed light 1 with an eyeball trim. It costs around $130 per light to install. How much does it cost to have an electrician install a light fixture? Electricians charge between $65 and $85 an hour, and light fixtures will generally run around $93-$240 installed. How much does it cost to put in a ceiling fan? The average range of costs associated with a ceiling fan is $575. How much does it cost to put in recessed lighting 1? The average cost of installing recessed lighting 1 is $130 per light. Where should I put my recessed lights 1? 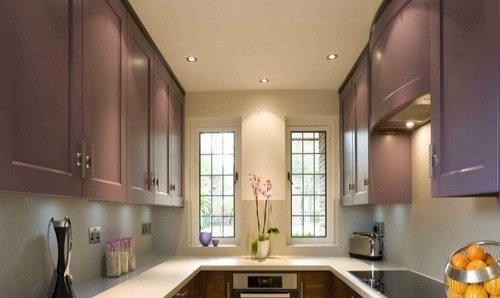 Recessed lights 1 can be installed in any room of the home, but work best in kitchens and living rooms. They should be installed 4-6 feet apart and 12-18-inches from the walls. 1 Recessed lighting: A type of recessed lighting where the light is installed into a hole in the ceiling, giving downward light. How much does it cost to install recessed lighting in my city? Cost to install recessed lighting varies greatly by region (and even by zip code). To get free estimates from local contractors, please indicate yours. The cost guide has been remade adding more information and updating the costs. The old information has been updated and more information about the process and costs has been added. The sections "Professional installation", "Installation considerations", "Planning the layout", "Type of housing", "Type of trim", "Type of bulbs", "Type of light", "Fixture rating", "Types of wiring in the house", "Calculating load", "Labor and installation" and "Outdoor installation" have been added, and now there is more detailed information about the different options and possibilities with their costs. For example, you can find different tables with the types of housing, trim, and bulbs, their characteristics and cost. The "Additional considerations" section now offers information about permits, DIY projects, and dimmers switches. A "FAQ" section has been added, where you can find any other piece of information that may not be found in other sections. Finally, an image for a better understanding of the project has been added and the national average has been updated.